I love to draw... Star Wars pictures! Drawing Star Wars pictures is one of my biggest hobbies! I simply focus on one detail, then the next and the next, until the entire drawing is done. Click on the thumbnail, my drawing opens in a new window. 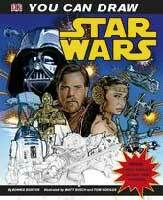 This book, "You can draw Star Wars" by Bonnie Burton has really helped me with drawing better Star Wars pictures. I draw in pencil, so I can erase it when I do something wrong. This book shows you how to draw characters, ships and weapons, but also how to make a Star Wars comic (although I haven't done that yet). I've photographed my Star Wars Portfolio by Ralph McQuarrie, so you can check it out. It's a portfolio of the Star Wars Return of the Jedi movie, and holds 20 drawings.